What is different about our new website and what use is it to you? A new website is an exciting venture! Over the years many new thoughts, ideas and improvement opportunities were collected which can now finally be realized. At the same time, it was important to us that well-functioning structures be preserved for the benefit of you, our clients. In the creation of the website, our focus and purpose has been to add value in the form of quality content and really useful functions. Naturally, an optically pleasing appearance is as important as a platform-wide, barrier-free operation. 1. 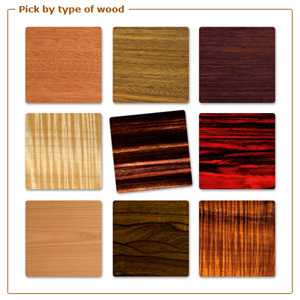 Guitars may be selected by various criteria, firstly, as before, by way of the series and now also by other parameters such as tone woods, pure acoustic vs electric/acoustic or by way of individual search filter. 2. Models may be evaluated by means of the guitar comparison in one view. 3. The overview page for the various models has been upgraded with additional photographs for your appreciation. As in the past, model information may be downloaded as a PDF. 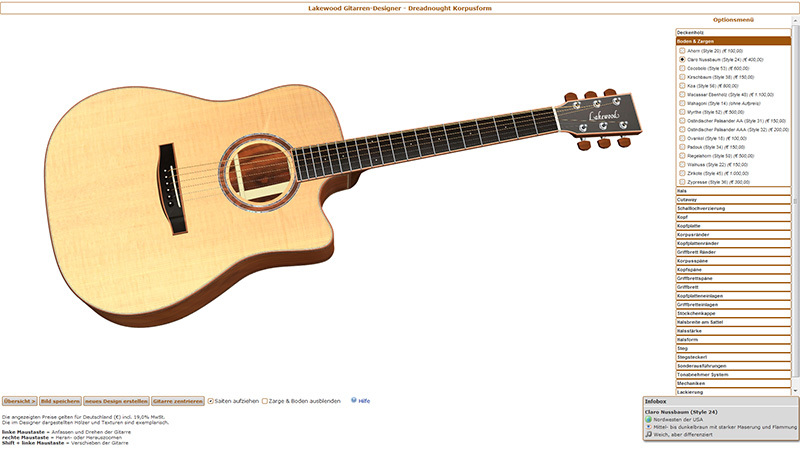 Now it is also possible to use a series model as basis for the Guitar-Designer. The nucleus of the Custom Shop is undoubtedly the Guitar-Designer. This is the vehicle for initiating your guitar design and storing the selected combinations. But in addition we now offer more detailed descriptions and pictures in our Information about the Customshop to assist you in your decision-making process. This is a most useful element in our new website - Availability of Models. Thanks to the commitment of our dealers we are now able, by way of weekly updates, to advise whether a particular model is in stock. If the model is available, the respective dealer is shown in the column to the right of the guitar. The complete stock may be viewed in the address column of that dealer. 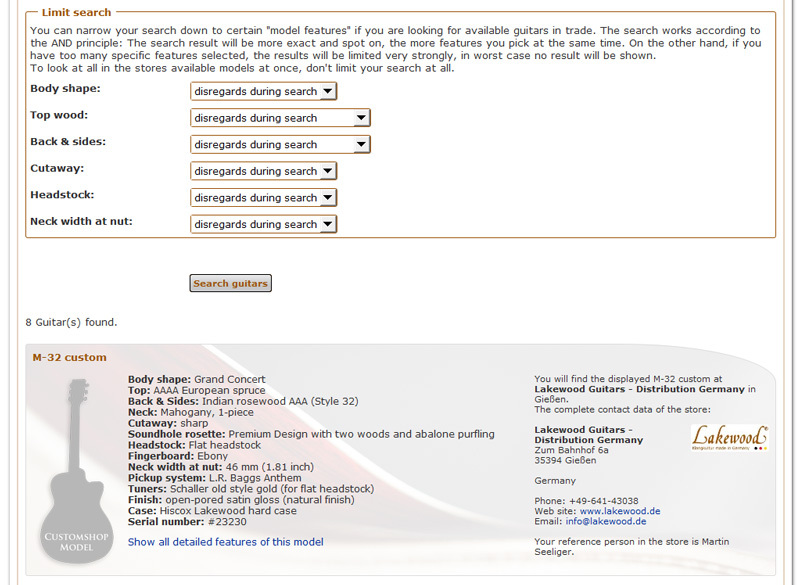 We have also introduced a search option with which you may check for availability of Customshop guitars. If a dealer has the particular model which fits your search criteria, this will show in the results together all the items stocked by that dealer plus his contact details. As we have said above, we are determined to deliver excellent content on our new website. The new FAQ section which may be interrogated by way of catchwords is considerably more extensive than in the past. With this section we have tried to anticipate many of your queries. The Guitar-Designer has benefited from an importantupdate. With immediate effect, it will operate under Windows, Mac, iOS, Linux andAndroid. This will impact particularly the mobile telephone environment; so atlast it will now work for iPads, iPhones and most other equivalents.Spectacular guitars may now be conceived and developed by swiping on a touchscreen. In addition, it will be possible to address your questions either to usor a dealer of your choice. There are also many innovations to discover, some of which affect operation and other content. We wish you an enjoyable journey through this new territory!